A long title for a very delicious cookie. 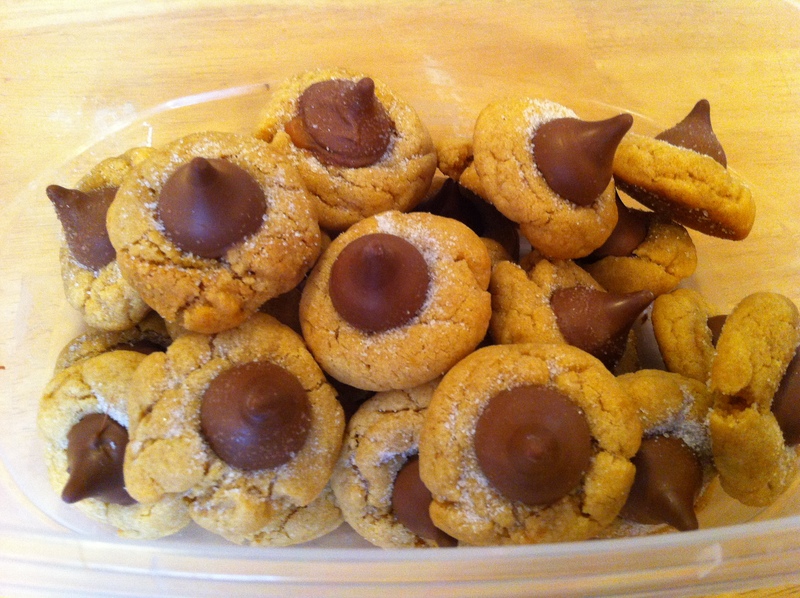 For Valentine’s this year I decided to put a twist on the traditional Peanut Butter Kiss Cookie. 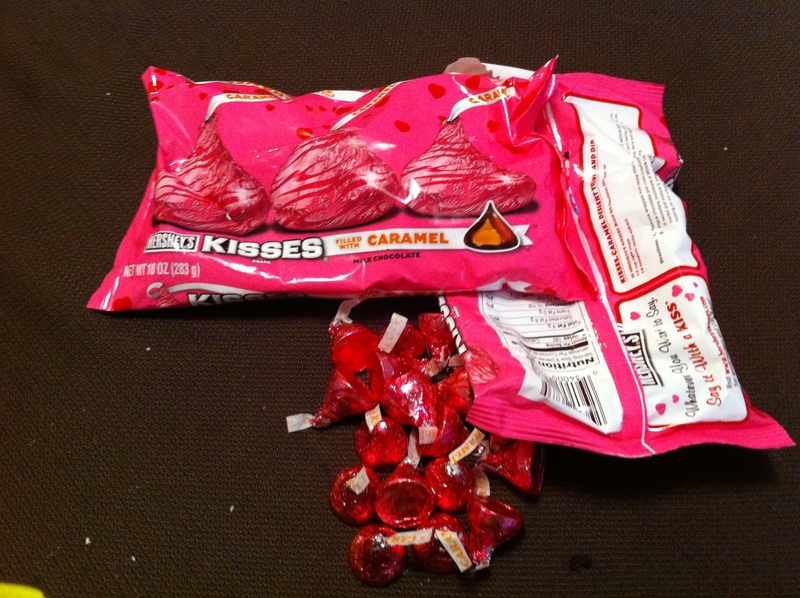 Instead of buying plain chocolate kisses I bought caramel filled kisses, this time of year they come in a pink bag and are wrapped in pink swirled foil. 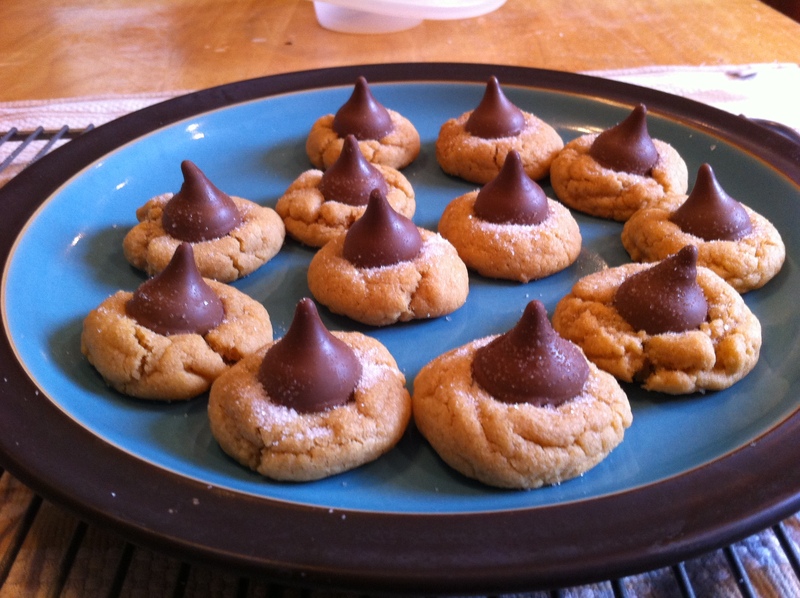 Note: Be careful when moving these cookies to a cooling rack or trying to stack them for storage, in the first few minutes after kisses are put on the cookies they will get hot and melty. My solution is to clear a place in the freezer to flash freeze the candy before packing the cookies for storage. 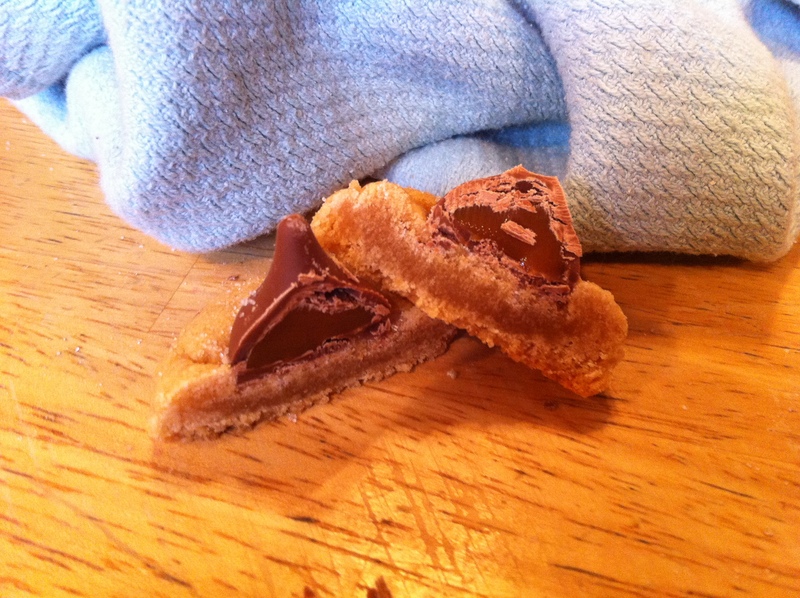 These cookies were a perfect hit, both at home our jobs, they went fast. They are rich but the salt cuts the sweet and few people ate only one. I know it is way past the Super Bowl now and I had plans to write this much sooner if not for the lack of internet this week. Every January/February it is the same struggle. You try to get back on track for eating healthy and watching calories. Then the events start to hit again. This year it was Super Bowl, Mardi Gras, Chinese New Year, and Valentines day all wrapped into a short two week period. Not that we celebrate all of these events but it can get difficult to stay on top of healthy eating. 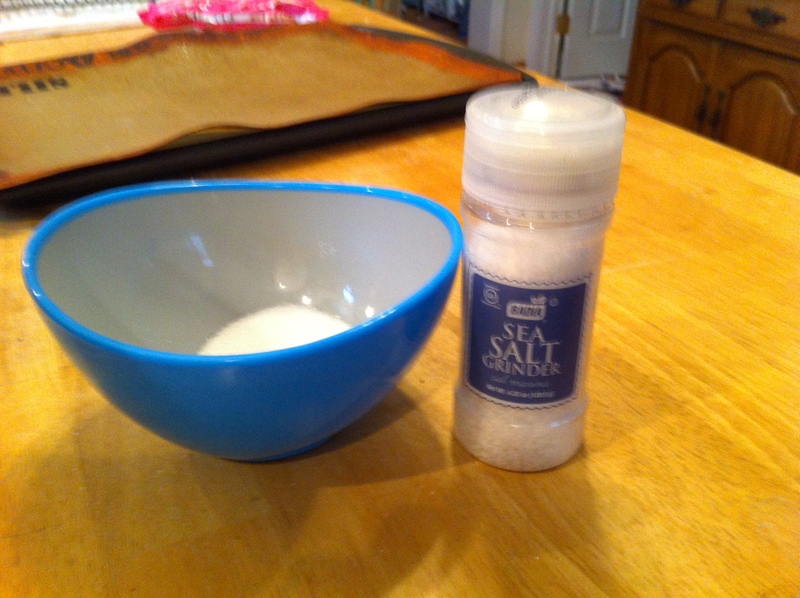 So this year I decided to do something different for the super bowl: a gluten-free salad. 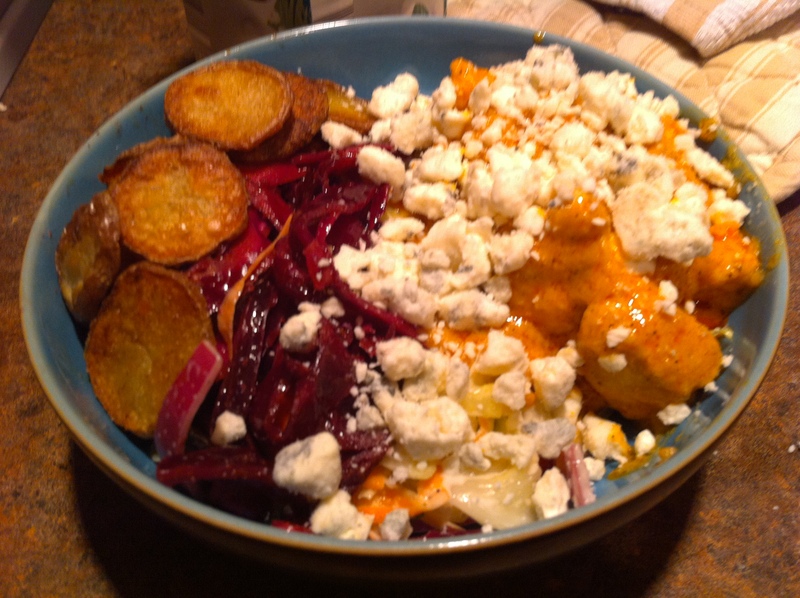 Now before you get upset or confused let me tell you what was in it: chicken breast in buffalo wing sauce, romaine lettuce, pickled red cabbage, blue cheese crumbles, and homemade potato chips for croutons. Does that sound better? Let’s just say my husband did not complain. So how did I make it? 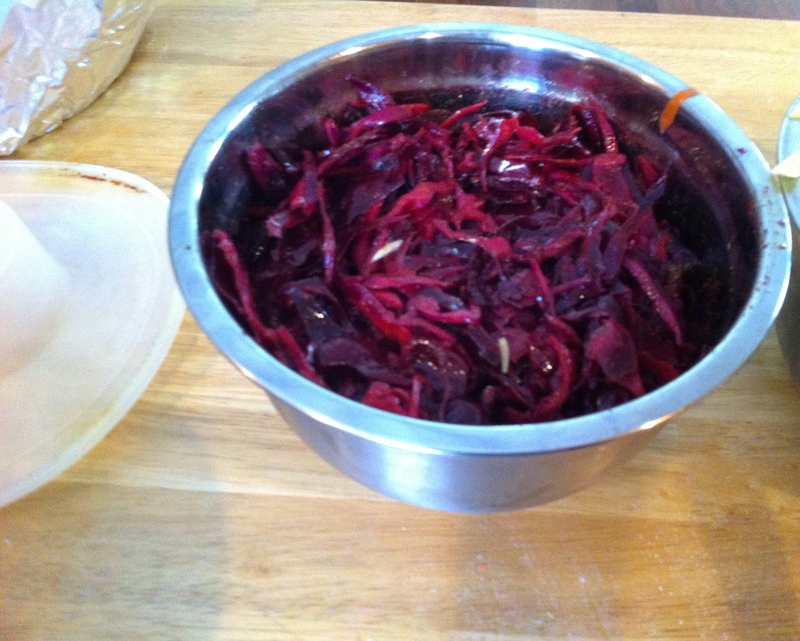 Step one: Well it does take some planning to make the red cabbage salad. I grew up near Northwoods Inn, a ski themed steakhouse in Southern California. 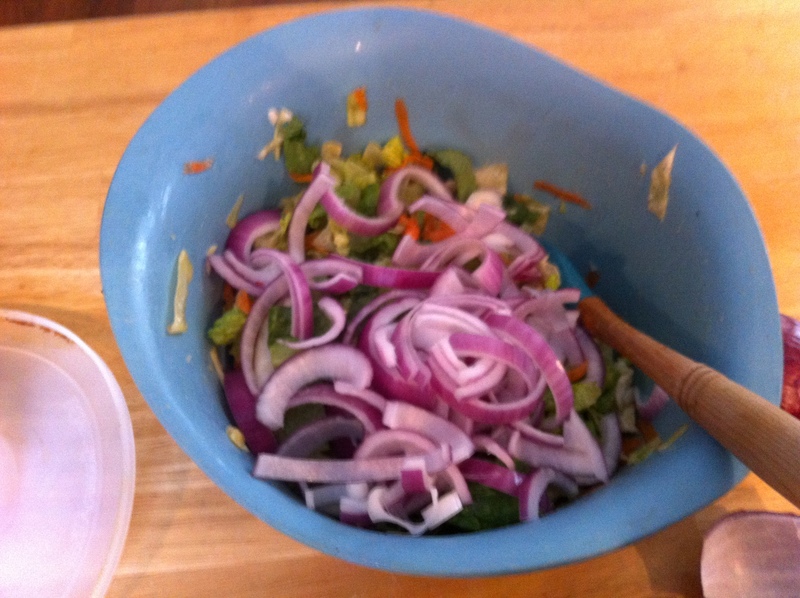 There they have a famous red cabbage salad that my husband learned to enjoy. 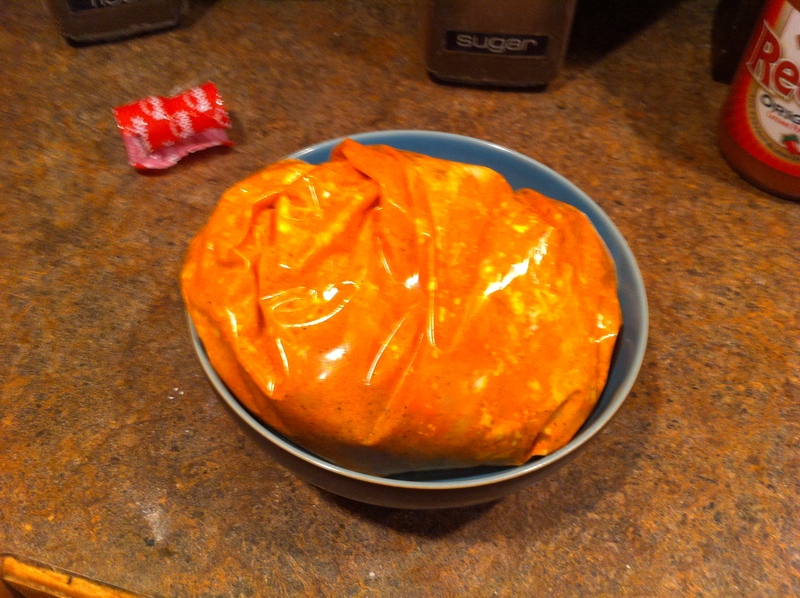 So I looked online for as close a recipe as possible. 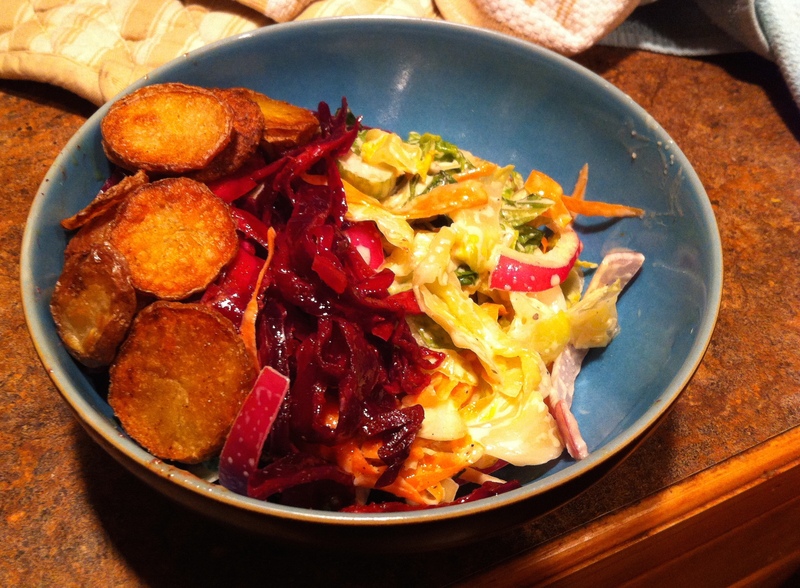 Even though this recipe calls for only 4 days of it sitting I found it was better after almost a full week but I am sure that depends on how thinly you slice the cabbage. 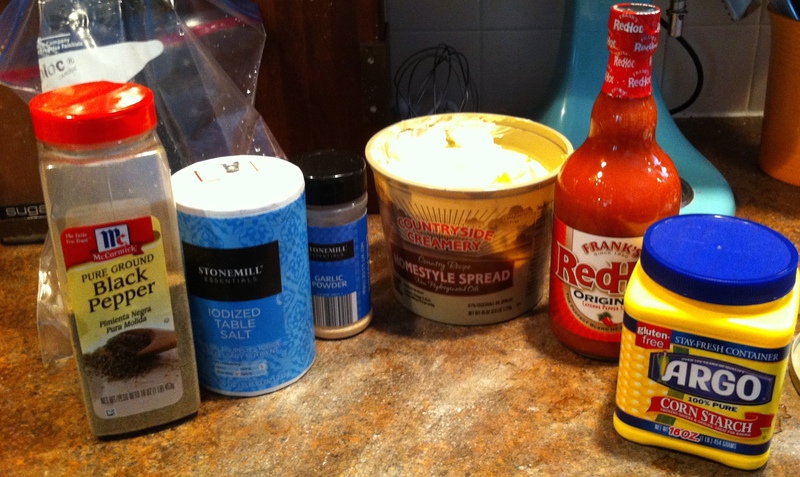 Step Two: To make the buffalo chicken I use all white breast meat. My husband is not a fan of working around bones. 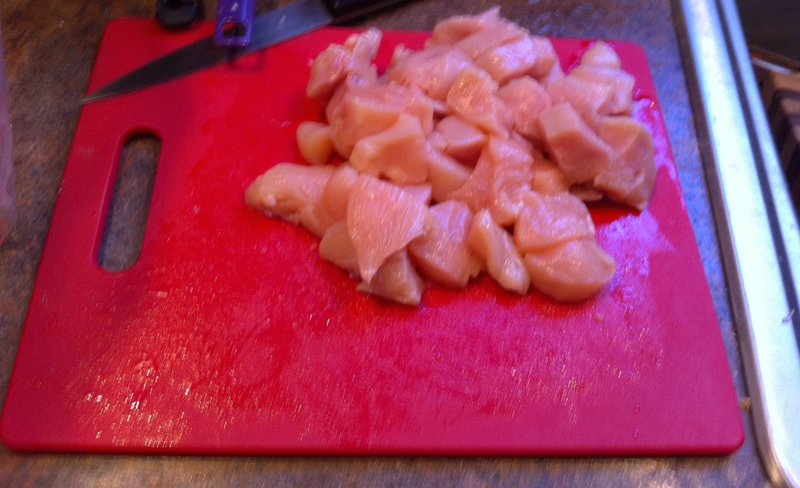 I cut 2 large chicken breast into cutlets or cubes removing any access fat. 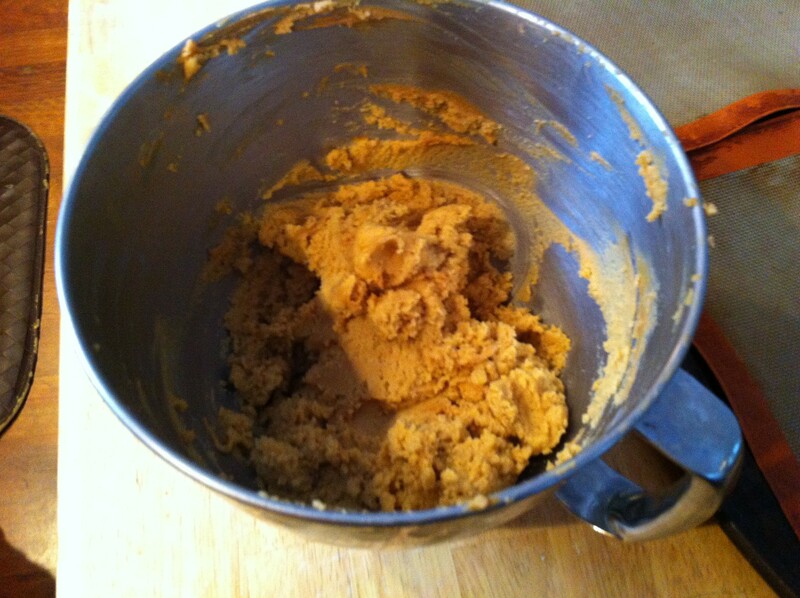 and 1/4 C butter (I use low-fat butter spread). These measurements can change depending on how garlicky or spicy you want your sauce to be. 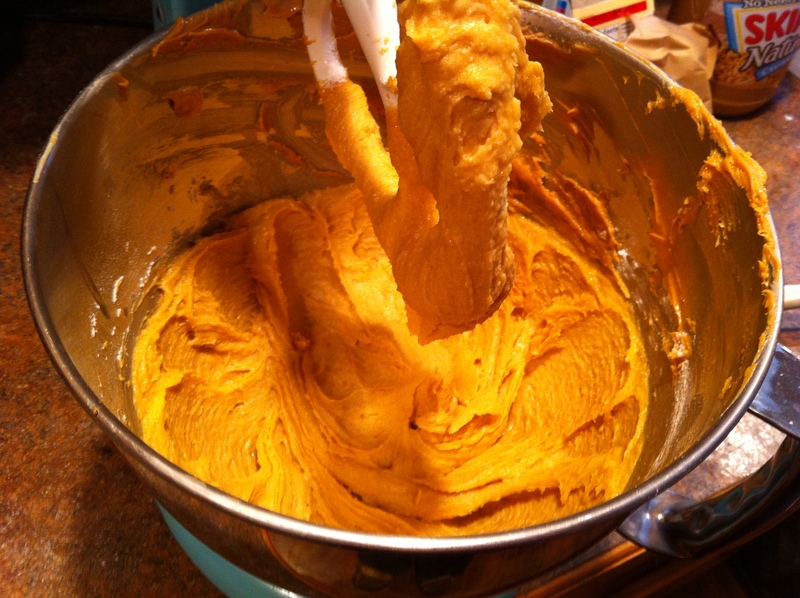 More butter means less heat, more garlic or hot pepper sauce means a spicier sauce. 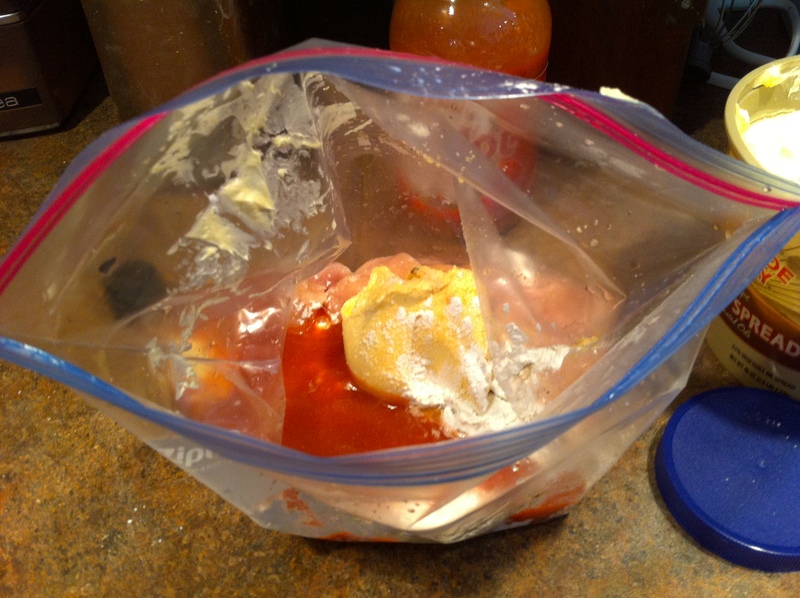 I let that sit and marinade for at least and hour in the fridge. 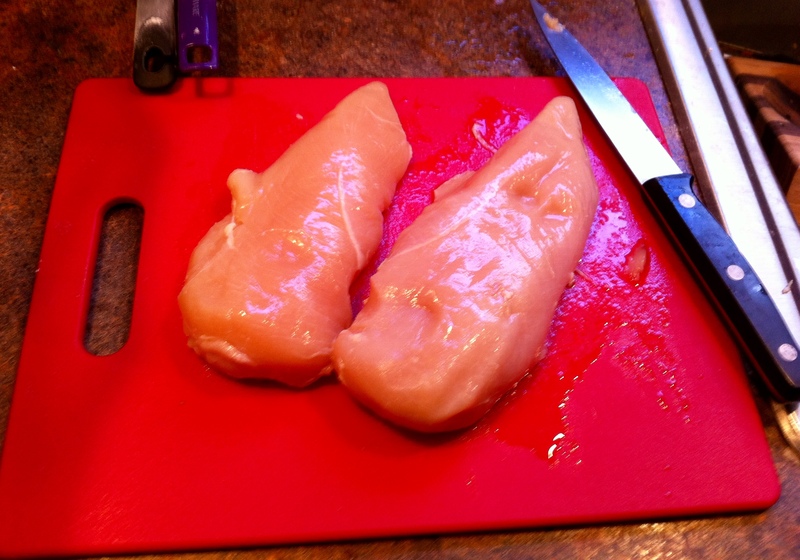 Then I heat up a pan or skillet with vegetable oil and place the chicken in it. I turn the burner on low, put a lid on it, and let it cook down. 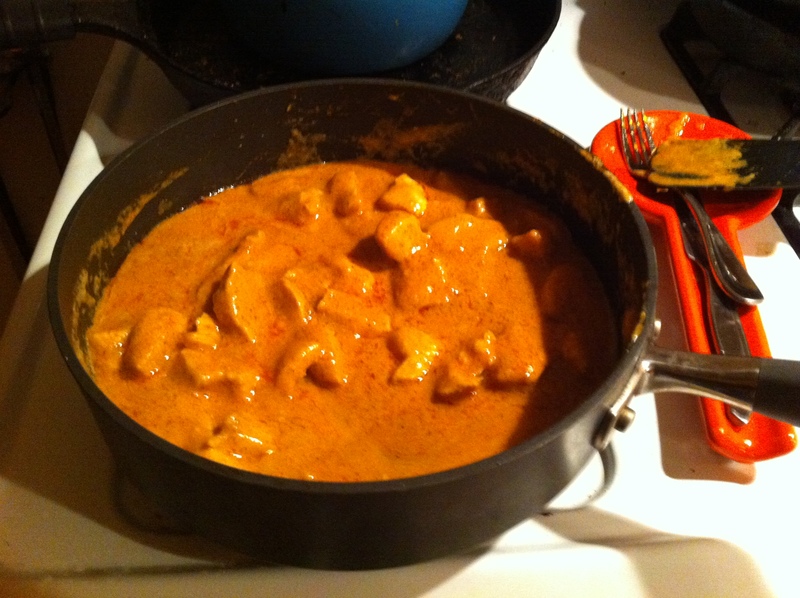 If you let it cook on high for too long the sauce will break down and the hot pepper sauce will get very spicy. This usually takes 10 minute or so but may be longer depending on the size of your cutlets and temperature of your burner. I double check them to make sure they are done by cutting into one cube. The chicken is better if you let it sit and cool a little before serving this way the corn starch has a chance to help bind the sauce together. 1. 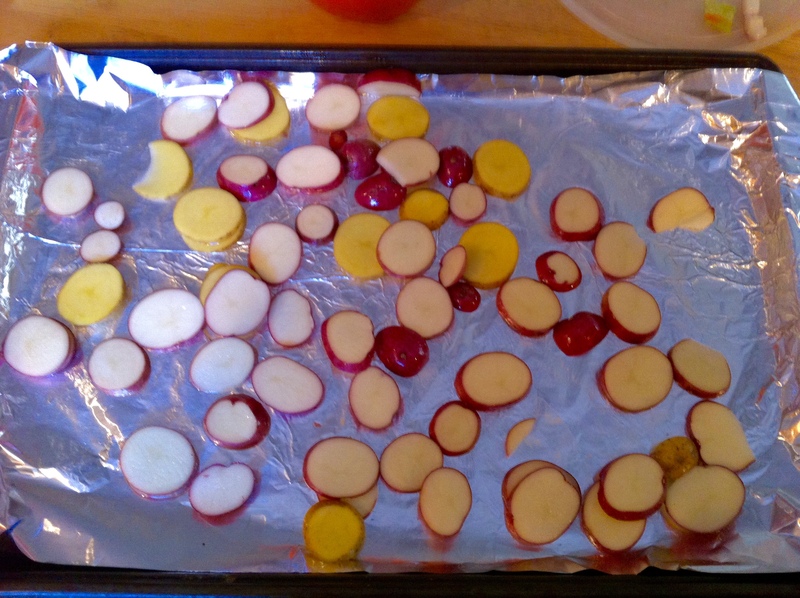 I preheated the oven at 350 F and cut the potatoes into as thin of slices as possible. 2. 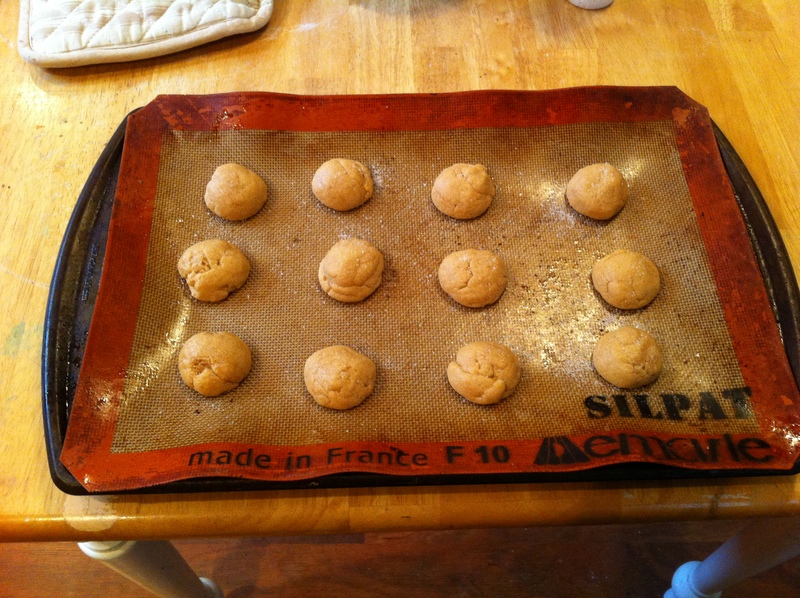 Then wrapped a baking sheet in tin foil and drizzled it with olive oil. 3. 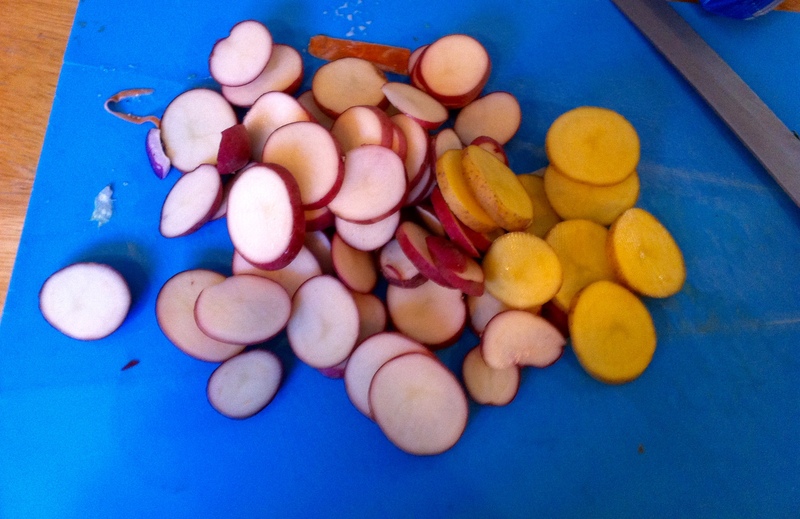 Laid the potatoes evenly and lightly salted with season salt. 4. 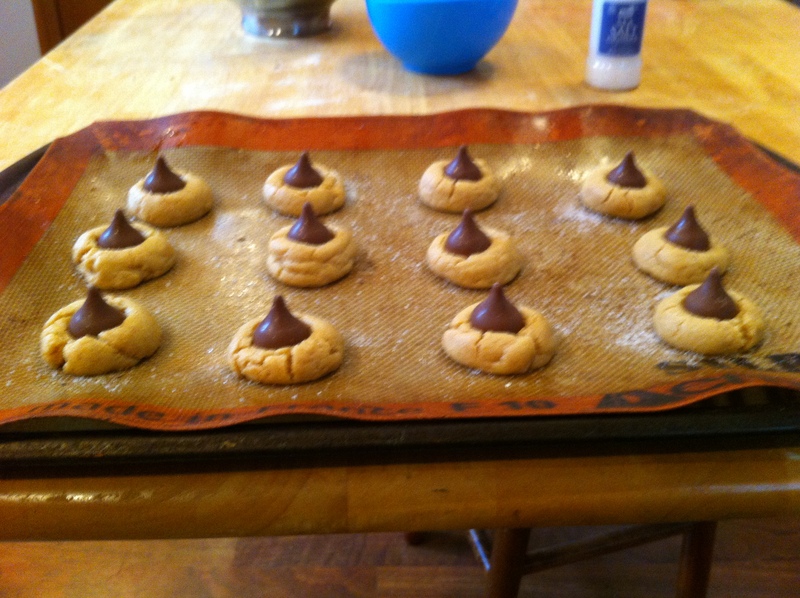 They baked for about 30 minutes to 45 minutes. Some were ready sooner than others- so after 30 minutes I checked every 10 minutes. When they are crispy and with little to no bend they are done. 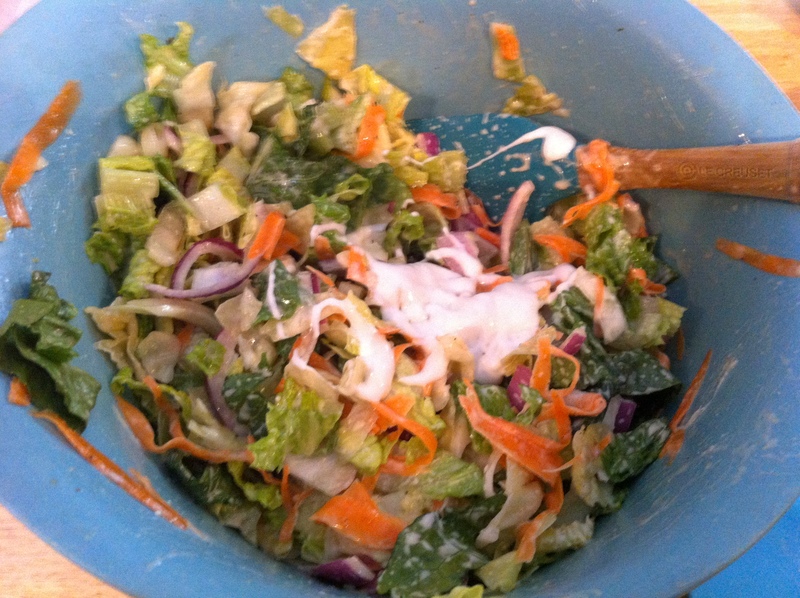 To create the salad I cut up romaine lettuce, red onion, and carrot and mixed this together with blue cheese dressing. 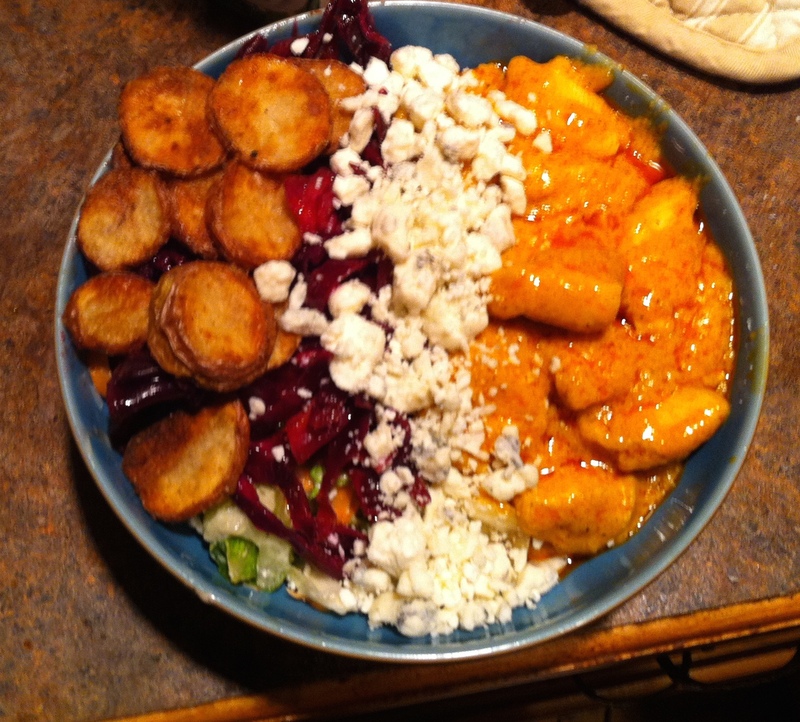 Then began to layer the goodies: red cabbage, then the Buffalo Chicken, blue cheese crumbles, and potato croutons on top. What do you think an acceptable alternative? 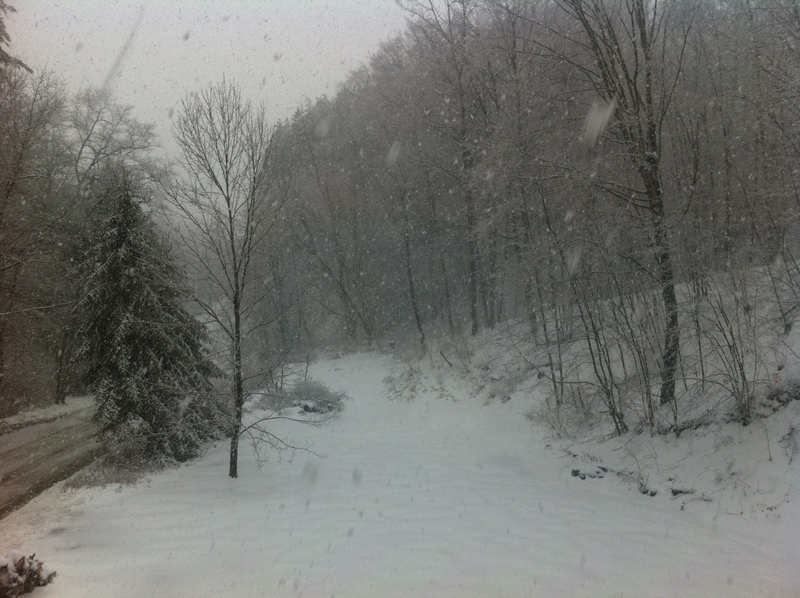 Not long after I wrote the staycation post the power went out at my house. 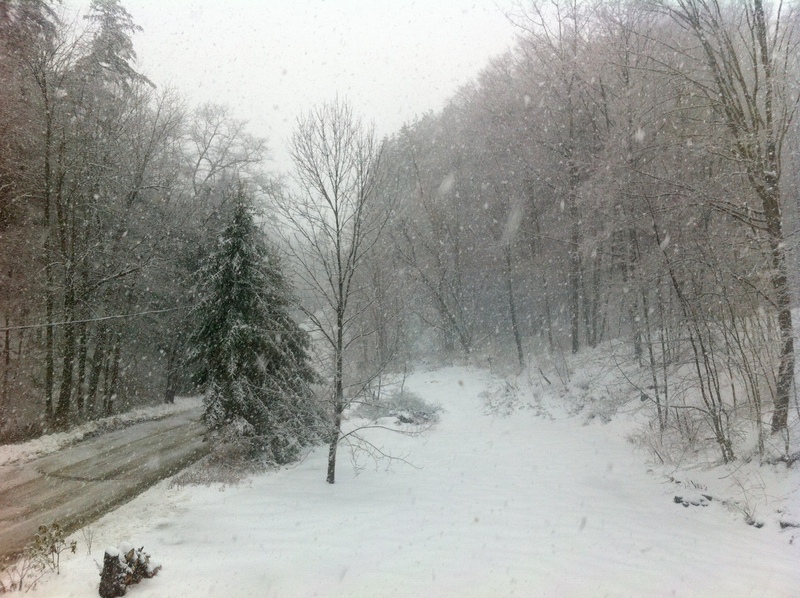 We had gotten 6 or more inches of snow and many branches were falling down in the trees around our property from the weight of it. We just got power less than 30 minutes ago. Yes that’s right almost 30 hours later. Let’s just say being without power for that long you have no choice but to move at a different pace. Luke didn’t go into work today because we also had no running water (the well runs on electricity) and one car that needed a jump start because it’s been so cold it stalled on us. So we played board games, sat by the fireplace, read, listened to sermons on Luke’s phone, journaled, spent extra time with the dog, and talked about the future. We also laughed as we planned meals with only a stove top to use (oven is electrically controlled) holding lanterns and flashlights up to help with dinner prep. It was like camping indoors without bugs in the winter. It was an adventure but I think both of us are glad it is over. So it’s winter break. A week long holiday that doesn’t exist where I grew up in SoCal and still confuses me a little. But with it being in the single digits for Valentines day and an official snow day for schools on Tuesday. 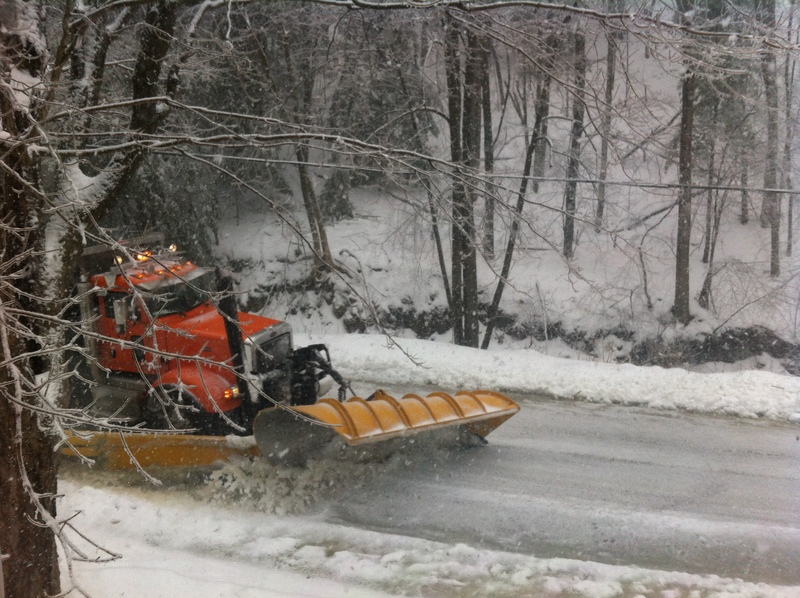 I was grateful Luke took an extra day off and I didn’t have to drive to Rochester. I have to say I’m not very good with staycations. I am learning, but it’s not easy. 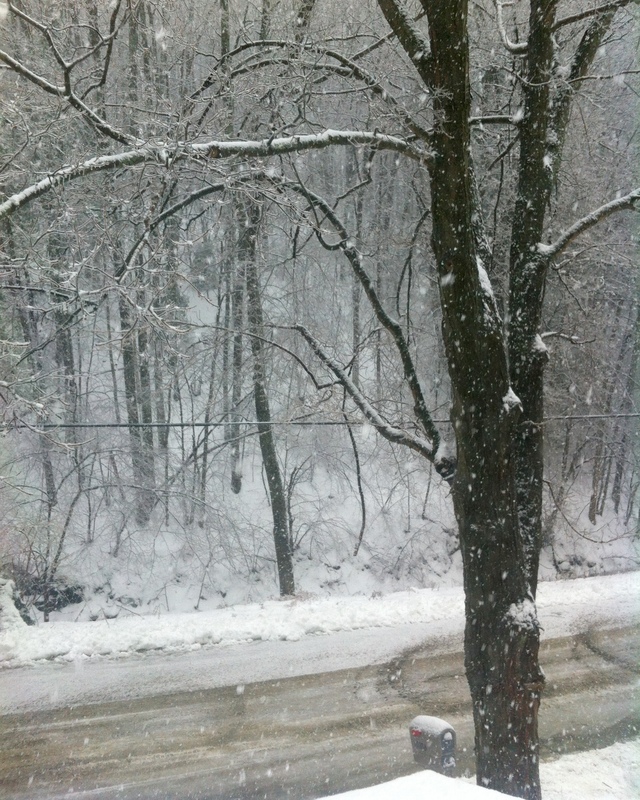 The fireplace is on the view outside is beautiful and cold. Kira is getting spoiled with so much more attention then she normally gets from both of us. But I have a nagging feeling I need to take this time to get ahead with lesson planning or do early spring cleaning. Although yes, I will probably do some of this, Luke is encouraging me to Blog, journal, play piano, sleep in, and overall just rest. I do not have a personality that rests very well. It takes a lot for me to “stare out the window’ and “just be”. Usually I do this best when I’m physically away from the everyday environment. As is I am having a hard time adjusting to the slower pace of this semester compared to the fall when I taught everyday in Rochester at two different schools. But I am making an effort to fill that “extra time” with items that matter just as much as official work like exercise, reading, meal planning, house cleaning and organizing and so on. 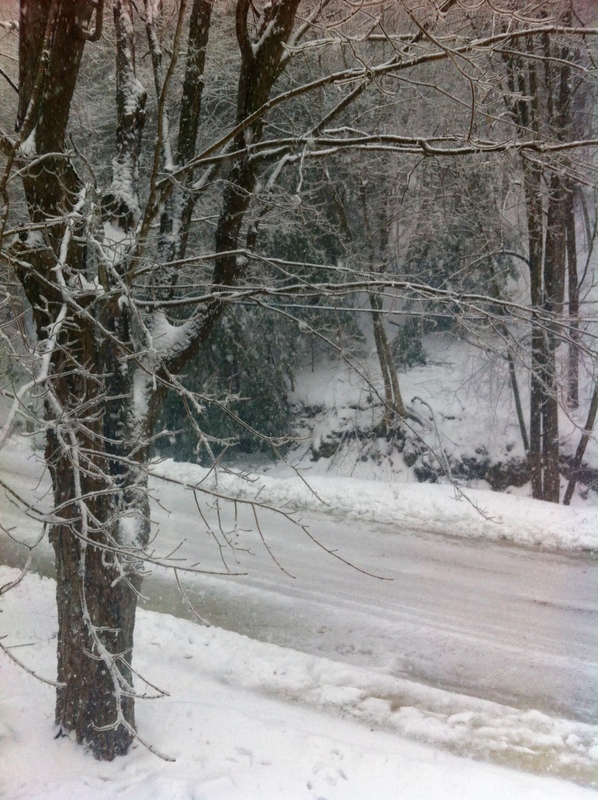 Learning to take advantage of the quiet seasons, the silent snow days is hard. But I am always reminded that I have this season as a blessing, as a moment to sigh and regroup from what was behind, and to prepare for what is ahead. 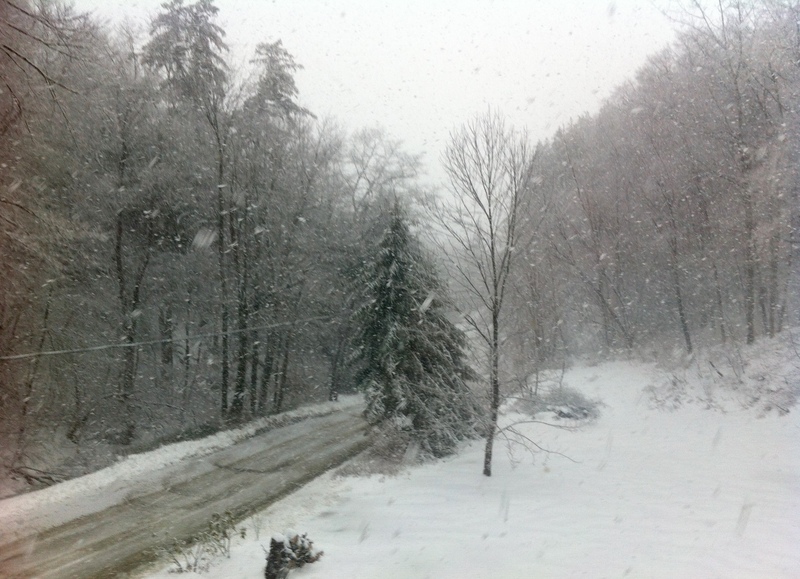 Anyone else struggle with snow days or staycations? I know it’s been a while since I’ve written. I’m try to get used to a new routine for the winter/spring semester. But more on that later. For Valentines this year Luke and I plan to get sushi again at our favorite place, same as last year. For more on this see: “valentines update” post from last year. We also plan to go see a movie. 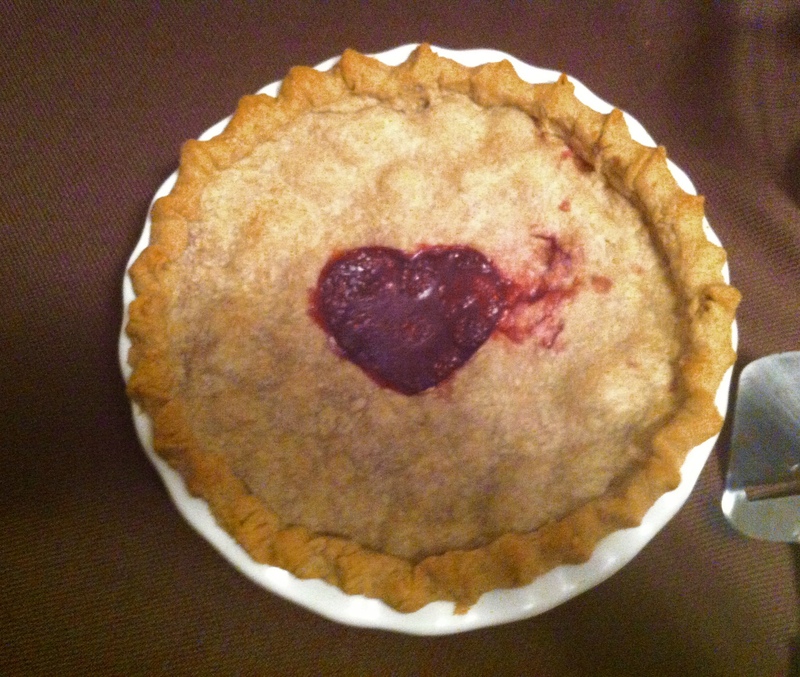 As usual I made Luke his Valentines pie. This year my goal was no white sugar. 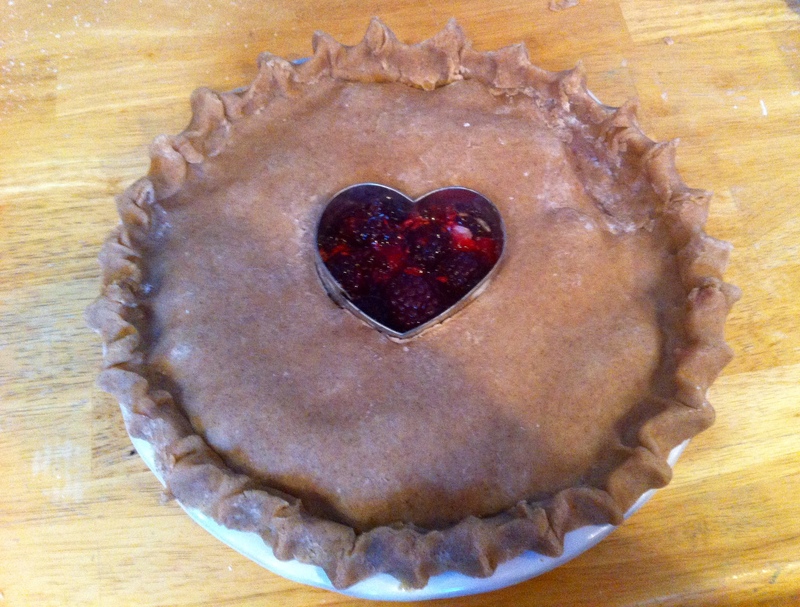 I used honey and lemon for the berry filling and local maple syrup to sweeten the crust. And it turned out great! It had more moisture in it then I expected so my heart center leak out a little. But it tasted better than it looks and that’s what counts. We paired this with homemade whip cream, no sugar, for a healthier treat. Hope you all have a great Valentines day!